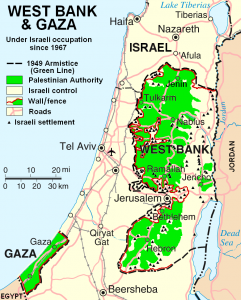 Agreeing on borders is a major difficulty with the two-state solution. When asked about rumors circulating in Jerusalem indicating that the Trump plan is, in fact, one written by Israeli Prime Minister Netanyahu calling for a two-state solution, and which Trump would then take credit for as his own, Shaked said that she had not heard those reports. Perhaps it should be pointed out that events related to a possible peace deal was number 9 on my list of 19 items to prophetically watch in 2019 (here is a link to a related sermon: 19 items to watch in 2019). Trump’s remarks are “a continuation of US policies in favor of Israel, as well as the American administration’s illusions about the applicability of the so-called deal of the century without recognizing [East] Jerusalem as the capital of the Palestinian state,” al-Tamimi said. Speaking at a rally in West Virginia on Tuesday, Trump said Israel would pay a “higher price” in peace negotiations with the Palestinians, who would “get something very good” in return. Trump didn’t offer any details on what the Palestinians would “get” in return. Tamimi emphasized the official Palestinian position, as posited by Palestinian President Mahmoud Abbas, which insists on the total rejection of the “deal of the century” and of American policy on the solution to the conflict. “The American administration will not find one Palestinian who supports its position,” he said. Palestinians remain upset with Donald Trump’s recognition of Jerusalem as Israel’s capital, as well as his decision to move the US Embassy to Jerusalem. The situation there will not end up as Donald Trump hopes. There will be changes coming–including war. One day, the nation of Israel will lose territory, and a peace deal may be the reason (for details, see the prophecies in the article Gaza and the Palestinians in Bible Prophecy). So, the Jebusites were there before the Jews. Could this have anything to do with the Palestinians? So, we do see a biblical connection between Jebusites and the various Canaanites–and that there was a tie to Gaza. Palestinians dominate Gaza. Although Jerusalem became the capital of Judah, the Jews were basically pushed out of Jerusalem in 606 B.C. by the Assyrians. And from then, until its destruction in 70 A.D. and then again later in 135 A.D., Jerusalem was under the authority of Gentile governments. Anyway, the Jews are not Gentiles, but the Palestinians are. God says that the Gentiles will gain Jerusalem. Ultimately, and probably after more conflict, a temporary peace deal will be put in place (cf. Daniel 9:27; see also The ‘Peace Deal’ of Daniel 9:27). Things will go more towards the way of the Palestinians in time, but only for a time (cf. Daniel 11:40-43; Ezekiel 30:2-9). This entry was posted on Wednesday, February 13th, 2019 at 4:00 pm	and is filed under Prophecy. Israel minister plans Trump train station at Western Wall: Ramifications?